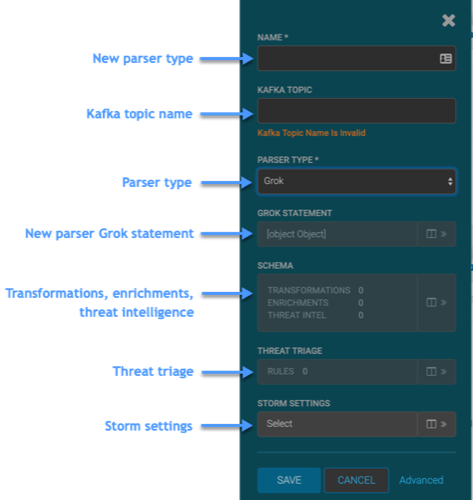 The Management user interface provides mechanisms for adding parsers, enriching telemetry events, configuring and prioritizing threat intelligence, and tuning parser Storm parameters. You can use the Management user interface main window to view existing parsers, start, stop, pause, and delete parsers, and start the process to add a new parser. Operations panel You can use the functions in the Operations panel to view existing sensors or view general settings. Management icons You can use the management icons to start, stop or pause a sensor, edit a sensor, or delete a sensor. Add new sensor You can change the status of or dismiss an alert. The meta alert feature enables you to create a system entity that contains a collection of filtered alerts. You can use the sensor panel in the Management user interface to create new sensors. New parser name The name of the new parser. This name typically matches the name of the telemetry. Kafka topic name The name of the Kafka topic. This name typically matches the name of the telemetry. New parser type The type of parser you are creating. New parser Grok statement The Grok statement for the new parser. Displays the panels for transforming the telemetry data or adding enrichments and threat intelligence information. Threat triage Displays the panel to prioritize for the telemetry threat intelligence information. Storm settings Displays the panel to configure Storm settings. Raw JSON settings Displays the panel to add or mdoify the sensor parser configuration, enrichment configuration, and indexing configuration. HDFS settings Enables the HDFS index, and specifies the HDFS name and batch size. 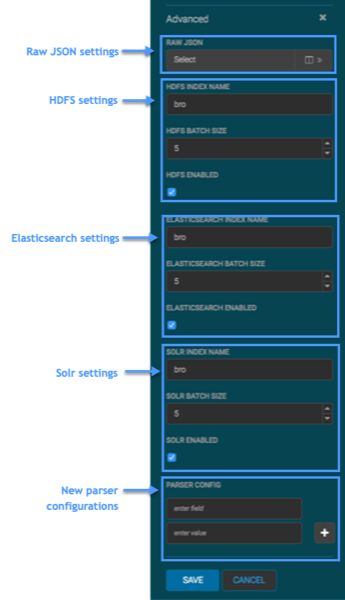 Elasticsearch settings Enables the Elasticsearch index, and specifies the HDFS name and batch size. Enables the Solr index, and specifies the HDFS name and batch size. New parser configurations The name and value for a new parser configuration.